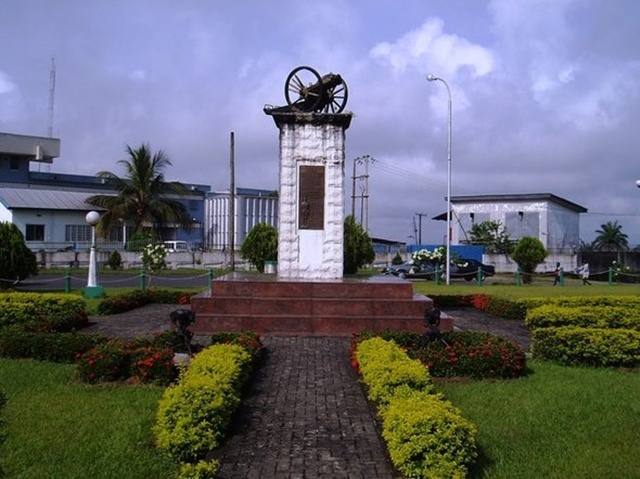 The Calabar Memorial is situated in a prominent position in a small park adjacent to the roundanout at the major junction of Barracks Road, Calabar Road, Moor Road and Club Road, about 200 metres from the Millenium monument and close to the sports stadium. The Calabar, Ibadan, Lokoja and Zaria Memorials were erected partly by subscription and partly from Nigerian Government funds. They stand at the Headquarters of the different units of the Nigeria Regiment and each is a War Memorial bearing a complete list of war dead on bronze tablets. The Memorial commemorates 407 casualties of the 3rd Bn. Nigeria Regiment and No.2 Artillery Battery, Nigeria Regiment. It takes the form of a concrete rectangular pillar on a stepped base, flanked by two machine guns captured at Ngwende on the 24 January 1917. 3972 Private Samuel Sabongidda, 3rd Nigerian Regiment, W. A. F. F. executed for violence 27th July 1917.